Everyone loves a good success story. Whether it’s when the little train finally can, or when the superhero saves the entire city, people curl up on the couch and can’t look away. As we throw ourselves into novels and movie scripts, we tend to forget real life, which means the words on the pages are successful. The pains of the world are invisible when actors portray their imaginary struggles with grace and unwavering beauty. But what about the success stories around us? The ones that aren’t made up? Like the one we saw on Sunday? A special sort of motivation rises up within yourself when you’re handed a pink slip. You’re fueled with anger, confusion and fear. You cry as you put your office items in the box and carry it to the car. Then you go home, drink wine and beat up your pillow. It’s a cycle everyone who has been fired goes through. Suddenly, everything clicks, and something in your soul is ignited. It’s the natural instinct of survival. Like a lioness fending off hyenas to protect her young, you fight. You fight off feeling sorry for yourself, and you fight off the urge to never go job hunting again. You now have something to prove. 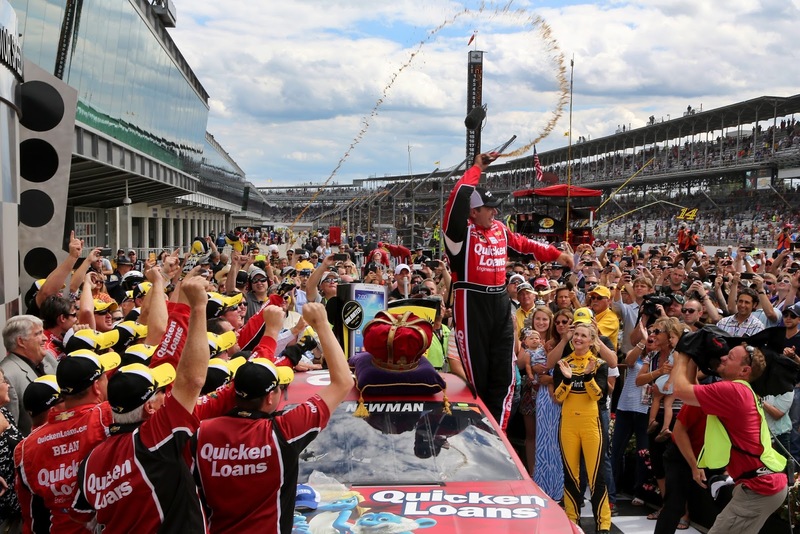 Ryan Newman has something to prove. Although he won in the wake of losing his ride for next year, there is still the pressure to perform, the pressure to be perfect. Pen in hand, he is currently writing the sequel to his success story. So should you. If you’ve lost your job, someone you love, or a spark inside yourself, keep going. Crumple up the rough draft and start over. Make the ending you dream about before you fall asleep at night. Because everyone loves a success story. And everyone deserves to live one. This week, I’m honing in on The Tricky Triangle and some things that have people riled up this week. Let’s see what I’m doing to stir the pot this week in Five Questions. How will Toyota do with more horsepower? Toyota has been running on reduced horsepower for a while now, and it definitely shows. This weekend, they’re going to up the ante and attempt to not blow anything up. It’s weird how this is the only manufacturer with issues; I can’t recall any similar scenarios (if you do, please tell me). Maybe those at TRD should go back to the drawing board, or maybe they already have. We’ll have to see if those problems have been fixed. Does anyone have the nerve to throw off the No. 48? This is something that grinds my gears repeatedly. As much as I hate to complain about competitiveness, this is something that has to be said. Every single week, when Jimmie Johnson has a great car and is eligible for the win, he runs away with it. Nobody touches him. I get it, his car is AMAZING. But let me remind you about last fall at Texas. With laps winding down, Johnson was battling against championship rival Brad Keselowski. Side by side, lap by lap, Keselowski pushed and banged on Johnson. The No. 48 ended up in Victory Lane, but something was off; the next week, they wrecked the car, and then Homestead was damaged by a bad pit stop. As all of us know, Keselowski won the championship. Why? It wasn’t because he had the best car all year, and it wasn’t because of luck. No, he got in Johnson’s head. Whenever someone has the courage to rub and rough up Five Time, he falters. I haven’t seen anyone try, and it worries me. If drivers know he’s the standard, that he’s the one to beat, go out there and lean on him. When he’s leading on a restart, get him lose. Johnson’s not use to that, and it will shake up his mental plan. That team is a mental team; if you want to beat that team, you have to get in their head. Is money speaking louder than performance? When it was announced Newman would be out of Stewart-Haas Racing to clear the way for Kevin Harvick, nobody was surprised. It’s sad that we could all predict that, but who couldn’t? The only other driver Tony Stewart could’ve kicked out is Danica Patrick, and that wasn’t going to happen. In this day and age, money talks, and GoDaddy’s money can gab your ear off. Patrick comes with them, so that’s where her Cup ride came from. However, her performance is lacking. I understand, she’s a rookie, but she should be doing a lot better with Hendrick-grade equipment. The sport revolves around cash, since it’s also a business. However, there’s a point where it overwhelms the sport, making the racing, performance and what really matters fade into the background. What can we do to fix this is beyond me, but the answer is out there somewhere. Clint Bowyer’s "Duck Dynasty" paint scheme: harmful or perfect? "Duck Dynasty" is a reality TV show centered around Duck Commander, a company nestled in Louisiana that makes duck calls. The business was created by Phil Robertson, yet son Willie has made it into a multi-million dollar brand. "Duck Dynasty" will be sponsoring Bowyer, who is close friends with Willie Robertson, next weekend at Watkins Glen. As soon as Bowyer tweeted a picture of the camo car with the show’s stars on the hood, people were outraged. “This is why everyone thinks NASCAR is for rednecks! We look so uncultured! What a terrible idea!” As I mentioned when the same comments rose from the NRA sponsorship at Texas, everyone needs to cool their jets and look at the facts. A large chunk of NASCAR fans watch the popular TV show. Because of that, A&E (the channel that owns the show) decided to sponsor a car. They probably have hopes it would turn more fans into avid watchers. Also, what’s with the sudden urge for our sport to seem proper and sophisticated? It all began with running moonshine, not caviar and designer furs. A great portion of the fan base is Southern. This sponsorship deal is appealing to the masses, the masses that we can’t overlook. I honestly don’t see a problem with it, and others shouldn’t, either. Has the new car helped or hindered competition? I’ve been a big supporter of this car, and I’ve always waited to see how it would affect racing at different types of tracks. Sadly, I now have to come to this realization: the Gen-6 is too aero-dependent. Clean air means too much; if your car breathes that in, it shoots off like a cannon. The other thing is that so many teams haven’t caught on to it. Hendrick Motorsports and Joe Gibbs Racing are the two that have found something special. Organizations like Penske Racing are up a creek without a paddle, it seems. Maybe it WILL take another season for everyone to get on the same level. There’s my optimism again. But, as of right now, this Gen-6 isn’t a success. 1. Yes, you are right, money outweighs performance, unfortunately. No matter where you go, or what you do, the more money you have, the greater chance you have of success. The ones with money will always have first dibs whether it's Fitness competitions, Olympic sports you play, or what college you go to. It's so sad, but true. 2. I wish more fans would see that JimmieJ does win because he is talented, and no one can catch him. I don't wish for wrecks, but I do wish for more aggressive driving. I hate when there's a lot of room between cars. I like side-by-side, close competition. I also wish I understood why the 3rd place car has the faster lap time, and is unable to pass the 2nd, and 1st place car. I heard the reason, but it still doesn't make sense to me. What Kasey Kahne did in Daytona in July was awesome. He tried to pass when the odds were against him and the chance to wreck was there....and he still tried. We don't see that often. It stinks that he finished so low- but what if the 9 hadn't tagged him? He could've passed Jimmie for the win...and that is what racing is about.